Suitable for Garden Designers, Landscapers and private individuals with large gardens or planting projects. Enough to treat 100x2Litre pots or 500-1000 bare root whips. 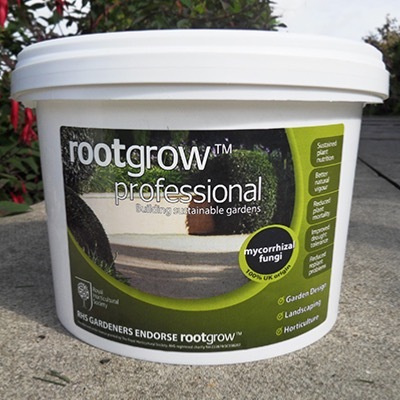 Ideal for trees shrubs roses and edibles Empathy rootgrowTM is a specially formulated blend of mycorrhizal fungi that develops a huge secondary root system to support your plants for their entire lifetime! Only one application is required and within 4 weeks your seedlings will develop the secondary root system to supply a lifetime of nutrients that will greatly enhance flowering and fruiting. Mycorrhizal fungi are widespread throughout nature and are a fundamental reason for normal plant growth and development. 90% of all plants rely on a mycorrhizal fungi root system. While a plant will gradually develop its own mycorrhizal root system planting them with Empathy rootgrowTM will speed this process up. It can take up to 3 years for it to develop naturally whereas Empathy rootgrowTM can get the mycorrhizal root system established within one month. RHS Endorsed By adding mycorrhizal fungi at planting time the treated plants: Have significantly improved vigour Have superior plant establishment Overcome replant problems more successfully Have better developed root systems Are better able to cope with conditions of drought.